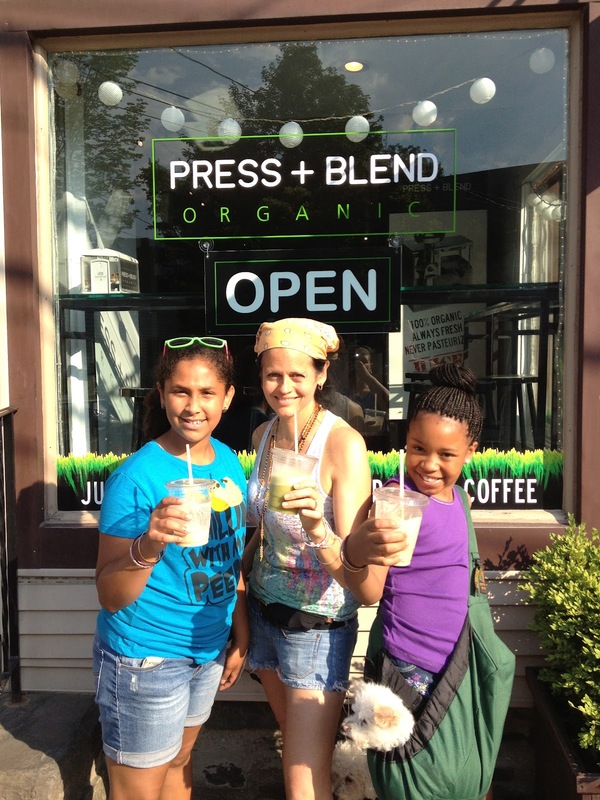 Back to the PRESS + BLEND– my new favorite raw vegan stop while I am upstate visiting Woodstock! I came in here the other day for a smoothie.. and left with inspiration! The inspiration and motivation is what I had needed to to begin my challenge to a one month raw vegan food experience.. and my continued efforts on my one year full vegan journey. I was so excited to see so many delicious options for both juices and smoothies. They use 100% organic produce 100% vegan and 100% raw! They make cold pressed juices (with a Norwalk juicer), superfood smoothies, raw desserts and raw foods! The other day I ordered ECHOS OF MY MIND: Acai, raspberries, peach, cashew, coconut water, coconut meat, agave, kale, spirulina and cacao. Today I ordered BANANA BOAT for the girls.. and THE TEA LADY for me. Their’s had banana, cashew, water, dates, vanilla and sea salt- a favorite among the kids! Mine had green tea matcha, banana, coconut water, coconut meat and agave. The agave was raw.. my new friend Mario even lifted the container for me. I love what some people will do to spread the joy and happiness of health! I really have to say.. I so appreciate all the extra efforts people make to accommodate my eating lifestyle. The smoothies were all delicious, refreshing and nutritious! Press + Blend is also great for snacks and desserts. I often pick up whatever they have made that day- acai cheesecake, acai cacao bowl, granola, nuts and dehydrated chocolate cookies etc! Thank you PRESS + BLEND for being in one of my favorite towns!